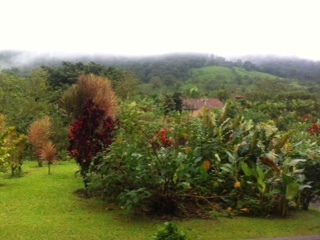 While on vacation in Costa Rica (which is BEAUTIFUL!!!! ), I was inspired by this view from our hotel room to write this poem. Nature is so beautiful and peaceful, something that cannot be packaged, bought or sold. It soothes my heart and spirit and does miraculous things in my soul. The refreshing rain intermittently comes to cleanse the earth and cause more growth as a whole. The rich and different varieties of every color and hue, size and shape, texture and feel. Amazing and inspiring as they all are interspersed on numerous hills. Interacting and not, supporting and not, propping up, colliding yet all are still here. Bending and touching as they will. Oh, that we humans would take note and learn from nature. Communities of diverse plants living together each individually yet so beautiful together. Interacting, supporting, upholding, respecting and embracing one another. Just like nature, we are different, distinct and yet come from the same source. Each created by God to a particular time, place, race and purpose. A people of God and if we are believers, then people of blessing and not curse. How can I ask God to bless you today? As God helps, blesses and serves me. To get away is so important to do so we can relax and reflect. Whether the leaving is mental or physical, it is something we should not neglect. We will become more focused and purposeful in our talk; then our walk, it will affect. As I’ve learned from a country of peace I, in turn, share this with you. How refreshing and rejuvenating embracing peace can be if one embraces it true. I vow to go home and do more to bring peace in all that I do. Being peace in the midst of chaos. Doing peace work at every opportunity. To help bring peace to our world. Praying more countries embrace peace and the beauty of diversity. Thanks for sharing. Amen!